It's cold and there are snow flurries. I'm feeling it in my bones and I need some comfort. 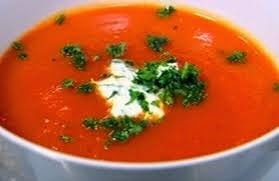 Not many things make me happier than a nice bowl of soup and there are few soups better than a plain old tomato soup. Nothing fancy...just tomatoes, onions and broth. That's what's coming down for dinner tonight along with some homemade sourdough with toasted Le Gruyere. 1 quart of home canned plum tomatoes or 1 28-oz. can whole peeled plum tomatoes, puréed (include the juice) try to find San Marzano tomatoes from Italy as they are as close as you'll find to home canned. In a nonreactive 5- to 6-quart pan, heat the oil and butter over medium-low heat until the butter melts. Add the onion and cook, stirring occasionally, until soft but not browned, about 7-8 minutes. Add the garlic and cook for another minute. Add the flour to the onion and garlic and cook for another couple of minutes. This will get the raw taste out of the flour. Discard the thyme sprig. If you like it "chunky" its ready to go. If you like it smooth then use an immersion blender or purée in two or three batches in a blender or food processor. If you used a blender or processor then return the soup to the pot and adjust the salt and pepper. Reheat if necessary. Croutons, goat cheese, or parmesan all make great garnishes. There is also nothing wrong with sprinkling a few Fritos on top either. No need to mention grilled cheese sandwiches.